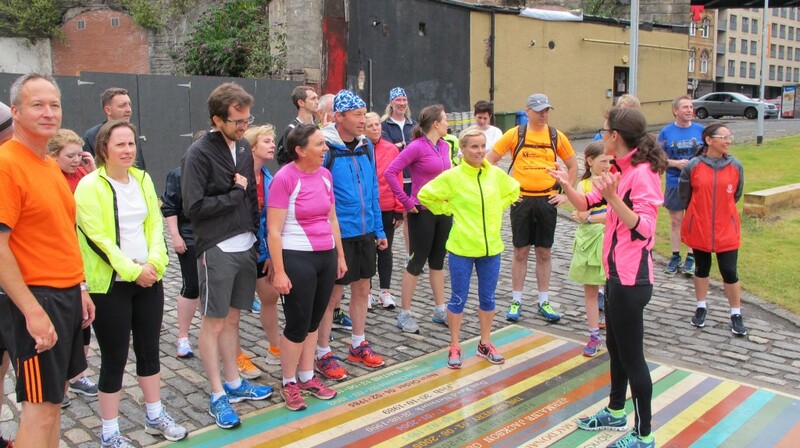 This summer we held the first “Leg-a-See” Art Run with Architecture and Design Scotland. 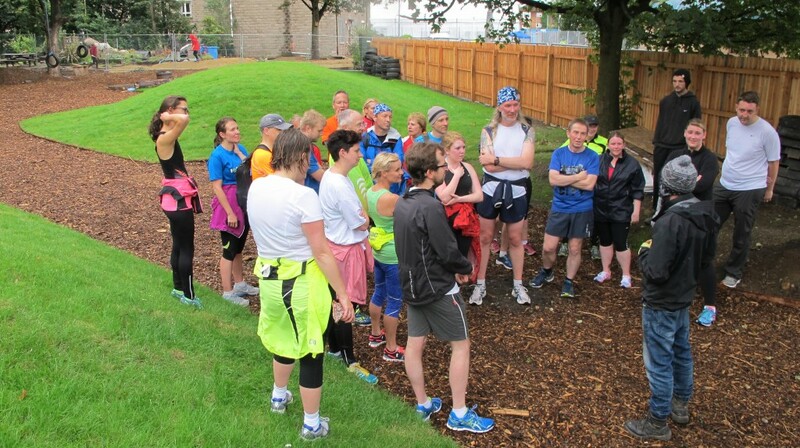 We were proud to be part of Glasgow’s GREEN2014 programme exploring the environmental legacy of the Commonwealth Games. 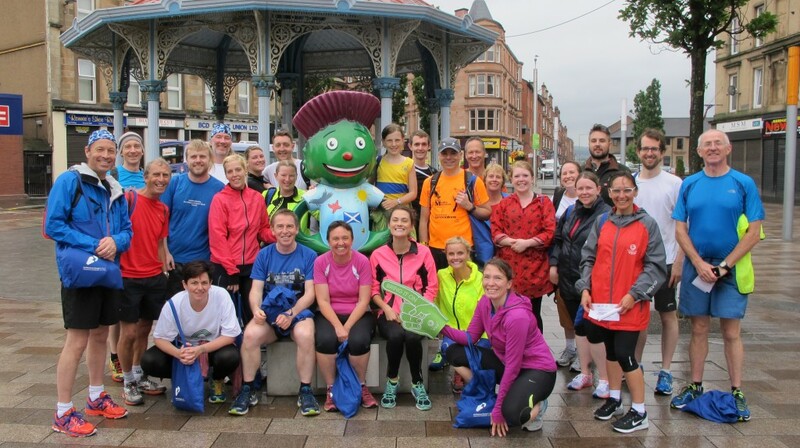 We had so much fun researching the history and regeneration of Glasgow, and were bursting to share it with the 30 dedicated runners who braved the drizzle to join us on their Saturday morning. We met at A+DS’s headquarters at The Lighthouse in Glasgow City Centre. 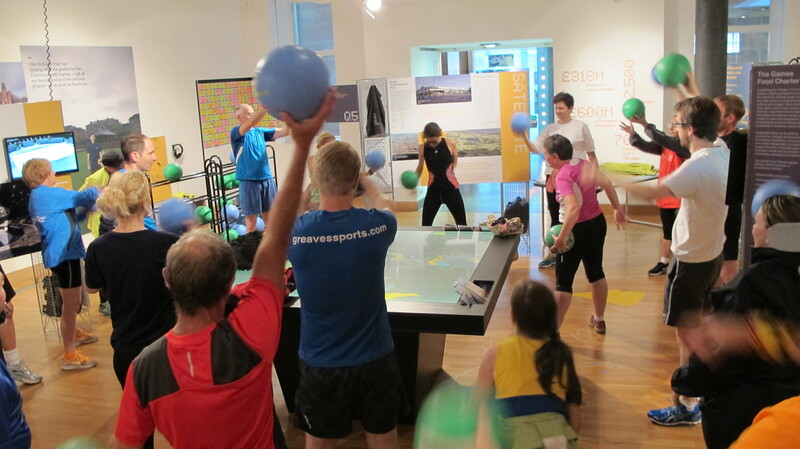 Leading a warm-up in an exhibition space is always incredibly surreal – are we runners or… performance artists? Members of the public weren’t sure. My favourite part of the trip was a stop at the Baltic Street Adventure Playground, which is a revolutionary area where kids can be kids, exploring “risky play” and using their imaginations unfettered. Robert, to the right of the picture above, is the play-worker at the site and held us all captivated with his passion for the project. He got some gasps when he told us what the children were ‘allowed’ to do – from creating dens with timber, hammers and nails to cooking cheese toasties over fires they’ve made themselves – and some teary eyes when he told about the confidence that he’s seen building in the kids, and their worries for future funding for the site. So much thought has gone in to ensuring that the Games are not just a blaze of activity for two weeks, to be forgotten about later. The Athletes’ Village is heated by a combined heat and power plant using a network of underground pipes, which will reduce heating bills by 60% when the area is repurposed into flexible homes for the people of Dalmarnock. 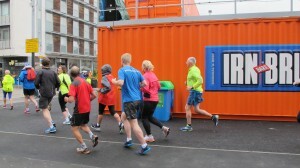 Greener traffic connections to the East End have been created, from frequent bus routes, to wide, segregated cycle lanes, to wide pavements that you can get 30 chattering runners down comfortably! It’s a really exciting time to be in Glasgow, and we so enjoyed being a part of the Commonwealth Games Legacy with Architecture and Design Scotland. We hope that we get a chance to come back and see how the city evolves as the years go on. If you like the sounds of our Art Runs, read more here, or follow us on Twitter, Facebook, Instagram and Pinterest to keep up to date with new plans.